The Ergocomfy standing mat is a good quality mat for use in the office or where you wear your shoes that allows you to fidget and move across a varied terrain. Learn more about this mat and how best to make use of it in this review by NotSitting.com. There is an explosion of standing mats on the market with textures and bumps and ridges and all sorts of shapes. This mat by Ergocomfy is one of the more reasonable mats in this area. Most standard mats have angled edges and a flat, uniform surface. This mat is different. It has a ridge line all the way around the outside and a big fidget area that you can put on the front or the back. This is a Standing Mat. 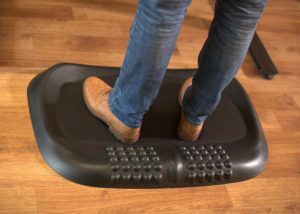 Standing mats are designed to be used with your shoes on. It takes a high quality foam that provides firmness to pull off a good standing mat. The reason is that when you wear your shoes you already have a lot of cushion for your feet and too much will generally stress your ankles. This is in comparison to a Kitchen Mat which is generally designed for use without shoes. The Ergocomfy mat has a uniquely designed fidget area with a big ridge and rows of uniform bumps. You can place this area in front of you and use it as an area for your forward foot. You can also place it behind you to essentially get it out of the way. It is enjoyable to use and can help replace a or add a “fidget bar” to your workspace. Fidget bars are something you can put one foot on, generally attached to the desk you are using, so that you can shift your weight around as you stand. The mat comes in black and has a slight glossiness to the finish. With the raised edges and fidget hump you will definitely get comments from your coworkers on your standing mat choice. This mat comes in a single size and so is good for single position desks, like the Luxor standing desk. If you’re using this mat on a slick surface or on a treadmill, be aware that it is slippery on the bottom and will move. You will want to use an additional non-slip mat or product between the Ergocomfy and the floor. This isn’t a big deal until you wipe out for the first time. If you’re on a standard corporate america rug then this will stay in place just fine. You also need to be aware of the ridge line around the mat which can be a trip hazard, particularly as you exit the mat. Generally you will have no trouble clearing this ridge, it is shorter than the typical height of your step, however if you exit the mat oddly you may catch it. The Ergocomfy mat is available on Amazon.